saw some construction going on yesterday, corner of dundee and pfingsten... signage indicated it was a greek place from "georgie V" (name sounds familiar but don't know too much about that). the construction made the front corner/entrance look like a giant gyro spit. still very preliminary but i'd say it's further along than the superdawg in wheeling at this point. Last edited by dudefella on July 22nd, 2009, 9:03 am, edited 1 time in total. This place is dying for a decent gyros place if that's what it will be. I bet Nick's Gyros in that little strip mall is not very happy about this at all. That is, if the new place is gonna be a fast food joint. seebee wrote: This place is dying for a decent gyros place if that's what it will be. I bet Nick's Gyros in that little strip mall is not very happy about this at all. That is, if the new place is gonna be a fast food joint. Nick's Gyros is closed as of at least a month ago. Rather surprising as it had been there at least 20 years. paulette wrote: The new place being built on Dundee and Pfingston is owned by Georgie V of the same name restaurant in downtown Northbrook. My understanding is it will serve lunch and dinner whereas Georgie V's serves breakfast and lunch. And if you look at the building front it looks like a giant gyro. paulette wrote: And if you look at the building front it looks like a giant gyro. I cannot imagine how they get this design past the Northbrook building dept / village council. Tammy76 wrote: Greek Feast in Northbrook has opened. I had a late unch there Tuesday, the day after it opened. It's from the folks who own Georgie V's. Outside, the architecture resembles a giant metal gyros cone, while the interior is very sleek and contemporary, a mix of regular tables, banquette seating and a high-top communal table. You order at the counter, and they bring the food out to you on real plates. The menu compares to other quick-service gyros places like Dengeo's, although it is all-Greek, and runs up to $24 for lamb chops. My take on it is that the portions are generous and the food a bit underseasoned. We tried the avgolemono soup, the Greek sausage plate and a spanakopita. The soup came in a huge, brimming bowl, a bargain at $2.99, but tasted bland, requiring spiking with the lemon wedges left out for the iced tea. The sausage was more flavorful, but pales next to that served at Avli or Greek Islands. The spinach pie was nicely crispy but also a little lacking in seasoning. With two Cokes, the meal came to $25, so this isn't especially cheap eats. The lot seems very small, so parking may be troublesome at peak hours. I have more than one friend who had their cars towed because they parked in the DQ lot. Be very careful! I am looking forward to trying Greek Feast. I think I will wait for the rush to die down! Counter service or table service? Any liquor? LAZ wrote: You order at the counter, and they bring the food out to you on real plates. Kind of a cool building, at least judging from a photograph. What you might expect if the Guggenheim opened a gyros shack. We took out from Greek Feast last night. Try a brief sampling of the menu. We split the gyros plate, souvlaki, greek feast salad and a smatering of appetizer spreads. I didnt try the greek fries but i am hopeful that they will be my suburban substitute for the greek fries at the athenian room. They offer a version covered with flaming feta cheese, which is their spicy feta spread appetizer. I enjoyed everything. The souvlaki (chicken) was cooked nicely, the gyros was tasty but definitely not homemade. The greek feast salad was excellent as well. My wife also enjoyed the taramasolata. This is exactly the type of greek restaurant we have been hoping for in the burbs. A lot closer to a cheap eats greek place then the more white table cloth greek dining offered at the excellent Avli in Winnetka. Sadly no grilled octopus on the menu but several other seafood entrees to choose from. They were absolutely jammed at 7pm. Ate lunch here today and found it to be a nice addition to the neighborhood, but nothing to run back for. I agree with the original poster that the food, gyros especially, was under seasoned. As others have said, parking is extremely limited and the restaurant is at a busy intersection. This makes stopping here at peak hours a bit of a chore. Personally I'll be sticking to Woodfire Chicken for a quick Gyros or Greek Chicken fix. The blue glass to the left of the gyro cone is an extension of the restaurant. There is a rib's sign at Lem's that once was a milkshake for a prior business, which I learned from Rene G. I wonder how the gyro's cone will be re-worked if this location should happen to fail. Mind you , I am not wishing anyone ill-will. Beer and wine, at least. Stopped there today for a late lunch prior to a hair appt in the Dunbrook strip, parking wasn't a problem at Greek Feast because it was so late so I didn't have to worry about the towing issue. Just had a chicken gyros sandwich, you can "feast" it by adding a drink and one of a few sides for $2.69 or so; I asked how the feta fries were and the counter guy enthusiastically said "great" so I supersized. They were not great. They were plain old fries with a sprinkling of feta on top. I was disappointed hoping they were like the Athenian Room greek fries I remember from the old days and was NOT impressed. The chicken gyros was eh. The pita was really good, warm, fresh tasting the but chicken was not hot nor did it have any flavor. There was a drop of tzatziki on the sandwich so they gave me a free little cup of some more, it was fine, not bad not great. There was a decent amount of pretty ripe tomatoes on the sandwich. Portion wasn't enormous but enough. I will try the regular gyros which is my usual preference but I'd heard the chicken one was good....eh. Won't run back though I'm sure when the weather is nice enough to walk we'll give it another try. George was there, sitting with someone, as usual I did not find him overly welcoming to his paying guests. Had dinner here recently and was fairly unimpressed. Nothing we ate blew me away. Some of the stuff was good, some was not. Avgolemono soup mentioned above, which is only $1.50 for a gigantic bowl when added to a "feast," was generally flavorless. We ate two spoonfuls and left the rest uneaten. Trio of spreads (we opted for Flaming Feta, Skordalia and Taramosalata) was highlighted by the light, toasty wedges of pita bread that were served with it. The "flaming" feta is supposed to be spicy (hence, the name) but I didn't pick that up at all. Nor could I really taste any fish at all in the taramosalata. The skordalia was way too potatoey and played like cold, garlicky mashed potatoes. It was pretty much the least enjoyable version I can remember having. We ordered 2 entrees: gyros plate and chicken souvlaki plate. The chicken was flavorful but dry. My wife admitted that she got what she deserved by ordering this instead of pork souvlaki and I didn't argue with her. Here, the highlight was the ultra-fresh Greek salad on the plate, which was topped with a generous portion of crumbled feta. Fries (chosen instead of rice pilaf for a $1 upcharge) were perfunctory, foodservice-variety and limp, at that. Gyros was just ok. The meat had no crispy edges and was kind of lifeless. Highlights here were the salad (again) and the rice pilaf, which was moist and flavorful through the entire chew. This was a weeknight. We arrived at around 7:30 and it was pretty dead. Maybe going when they are a bit busier would result in better food but that's just a guess. There were some other interesting items on the menu but if they're handled like what we had at this meal, who knows. As was posted above, I'll probably go back but I won't hurry to do so. Add me to the unimpressed crowd. Living so close gave me high hopes that I would have another spot to add to my rotation. Sadly that will not be the case. The wife and I went for lunch yesterday with a good friend. I opted for the chicken Souvlakia (my mistake) with feta fries, and my bride had the Greek salad. My chicken was very dry, on an ok pita with some onions and tomatoes. The chicken was just slightly warmer than room temp, and the fries as mentioned by Ronnie were food service type (cold when served to me) with some feta sprinkled on top. My wife's salad did look better than what I had. The ingredients were very fresh, and her chicken was at least warm. What I found funny was the look we got when we asked for anchovy on the Greek salad. It was like I has asked them to put BBQ sauce on the salad. We were informed that they don't have any anchovy in the restaurant. Service was quick and friendly. They were pretty full for 1pm on a Sunday. George was present but he only emerged from the kitchen to speak with a Greek family sitting next to us, ignoring the rest of his customers. 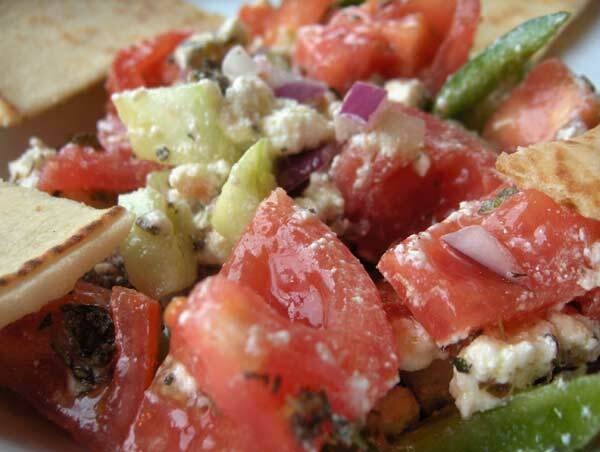 For more-than-decent Greek food not far from Georgie V's, I've been partial to Opa! Estiatorio in Vernon Hills. Not expecting much, I waited almost 2 years after they had opened to try Opa, and I've been pleasantly surprised on almost all counts. A clean, spacious, high-ceilinged dining room is host for pretty darn solid Grecian fare. Last Saturday I had a broiled whitefish that was nearly a foot long, and was as tender & flavorful as most Dover soles at one-half the price. Other standouts include hummos, avgolemono soup, Greek-style green beans, cold pickled beets in olive oil & bone-in braised lamb that--for ONCE thank goodness--wasn't fall-off-the-bone. Huge selection of appetizers & entrees as well. I had heard that early on Opa had had some slow service issues, but from my two visits in the last couple weeks, that has been rectified. Yes, I like Athena, Greek Islands & Pegasus, but this is closer & to my way of thinking nearly as good. 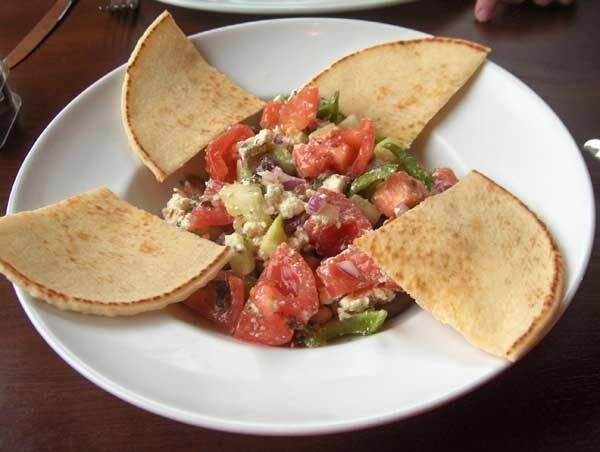 I've been to Opa several times, generally like the food but have never enjoyed their service. It is also a real sit-down place while Greek Feast is quick counter service. Demetri's on Lake Cook is certainly closer than Opa, pricier but with a broader menu. 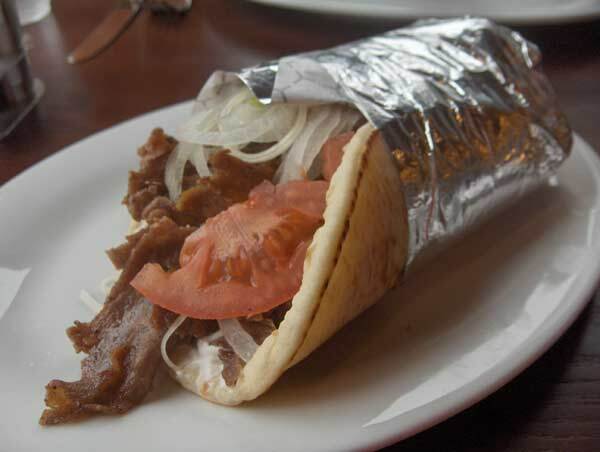 My husband brought in some gyros from Greek Feast last weekend, again we liked the pita, liked the rice, the side order of tzatziki was fine, he did not love the taramasalata (which he typically loves) and I thought the gyros were fine but no better than anywhere else nearby, like Dengeo's. It's just so darn close I really want to love it. And that George....I hope all his current friends are enough to support his ventures because his lack of attention to other paying customers. Was going to try them tonight, despite the concensus of mediocrity. They close at 9 pm. on Saturday nights! Great business idea...NOT. I'm going to buck a trend here. I went to George V's Greek Feast just before the lunch crunch. The parking lot was almost full with the early lunch crowd and the interior half crowded. The unresolvable issue of this place will be parking, because they are land locked. A sign on the door reminds patrons their cars will be towed from neighboring lots. At Greek fast food joints, I typically order a gyro with extra sauce and Greek village salad. At George's, I ordered a gyro without any special request for the sauce and Horiatiki Salad after verifying it was Greek village salad. When I order Greek Village Salad at Dengeo's, it is quite a chunky salad. The cucumbers and tomatoes are chunked larger than bite size. I spent quite a bit of time cutting my salad to reasonable bite portions. The feta is in blocks, which need to be mashed and integrated into the salad. The olives have pits. I enjoy my Village Salad and just accepted this rough construction as the norm. By contrast, George's Horiatiki (Greek Village) salad is far more refined. The tomatoes have been deseeded, a detail done at home and never in a fast food restaurant. The tomatoes, cucumbers and onions were cut to bite side. The peppers were cut into tapered bite size strips and olives were pitted. The Feta was already mashed and integrated into the salad. A lot of work I associate with this salad was done before I was handed my plate. Recently I read an article on better versions of Greek salad. The author had emphasized old school Greek restaurants use iceberg lettuce.. She commented more refined Greek salads now use Romaine lettuce, though I had not yet seen this. George's uses Romaine lettuce in their Greek salad. While not Earth shattering news, it was interesting to so quickly encounter an example so soon after learning about this. George's gyro's meat was cut quite thin, but on the plus side there was a lot of it. The Tzatziki sauce was applied sparingly. Normally I ask for extra sauce. I sometimes think I should skip the gyro to order Tzatziki sauce and pita bread. I decided to eat the sandwich as presented, because maybe I am missing the art of the gyro buried under Tzatziki sauce. Once I stopped missing my usual overdose with sauce, I found my gyro meat had robust flavor. The onions were too thin with very little bite to them. While I may not need to drown my gyro in sauce, it would have been less dry sandwich with a bit more sauce. I might order sauce on the side in the future to apply as needed. 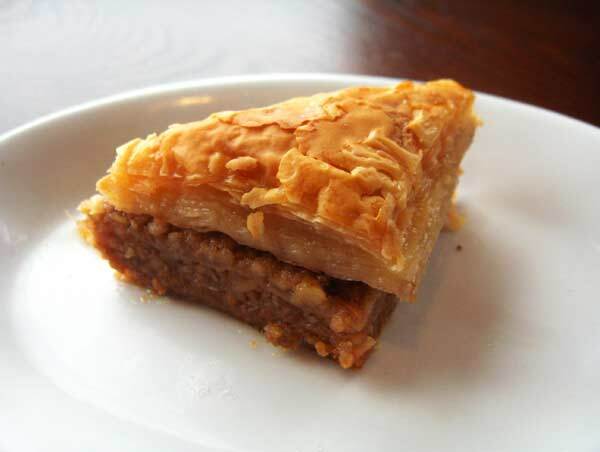 I thought the Baklava was too fresh from the refrigerator. Any subtlety to the flavor was gone due to how cold it was. I also thought it was a bit expensive. For a fast food establishment, the interior details of hardwood tables and woven leather banquettes are expensive. 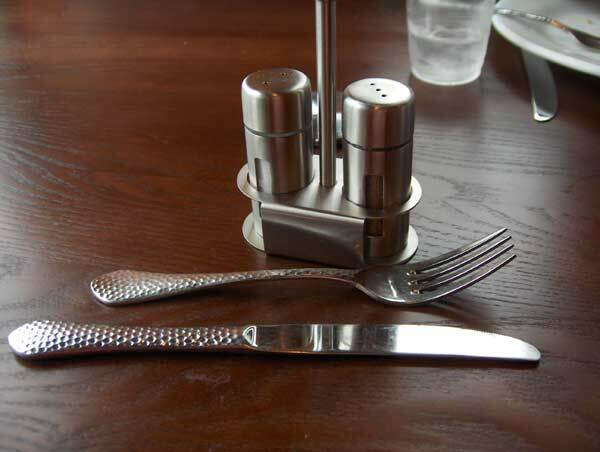 The metal salt and pepper shakers are sleek and likely one of the first things to disapeer. The silverware's faux hammered handles are not usually associated with fast food joints. There is quite a bit of ambition to make this a better Greek fast food restaurant. While I ordered what I always like, I seemed happier with my meal than those who have gone before me. The food is a manageable area to improve. I just cannot envision how they will work around their small parking lot. When I was leaving, there were more than three cars angling for my spot. Interesting, Cathy. For now, we'll just have to disagree on the gyros meat itself, which I found nothing special. But your comments on the salad line up with my experience. As I posted above, the salads we were served with our entrees were the best part of our meal. They were ultra-fresh and noticeable attention to detail had been paid in their preparation. Absolutely, salads are the way to go. Count me in as a surprised fan as well. Wife & I happened to Greek Feast by default last night at about 8:15 (they close at 9:00) and had a very pleasant meal of a nicely-done half Greek chicken with perfectly-done roasted potatoes (nice char-edges), and feta-flecked Greek salad as pictured above. Wife had the chicken gyros with the same accoutrements, and a mondo bowl of avgolemono soup, which was lemony, brothy, and just good. Certainly, prices are maybe 20% above what I may encounter at Nikko's, Costa's or Fodrak's (Lake County Greek fast-food haunts), but this seemed to be a step above, an actual pleasant dine-in experience. If they can overcome the nasty parking situation--signs all over over about towing if parked outside their tiny lot--they could be very successful & fill a nice little niche. They seem to have straightened out some previous quality issues in the 5 weeks since they've been open--good for them! As a native of Northbrook, as well as being Greek I am happy to write my first post on this site about Greek Feast. However, I must say that I am not impressed with the restaurant, although I wish the Vlahakis family all the best! I ordered the Dakos salad, chicken gyros, pork souvlakia, and an order of pastitsio, all to be split with my family. Again, there was nothing special about the food, the gyros was dry, and souvlakia lacked taste, and the pastitsio was the smallest portion I have ever seen, and cost $8.99, and served with rice! Pastitsio is already a pasta dish, why serve another starch? Like ordering ravioli with a side of spaghetti. MU_Grk wrote: As a native of Northbrook, as well as being Greek I am happy to write my first post on this site about Greek Feast. However, I must say that I am not impressed with the restaurant, although I wish the Vlahakis family all the best! . . . Thanks, for the thoughtful first post. Welcome, MU_Grk, to LTHForum. I hope we'll be hearing more from you. I stopped by Greek Feast to show a friend it's landmarkedness. There is a new sign on the door: After 6 pm, you may park in the 5th/3rd Bank across the street (Dundee Road). The signage advising your car will towed if you park in adjacent lots are now down. I imagine it is still true, though it probably didn't offer the cheeriest first impression. I really do wonder how they got away with building this place with such inadequate parking.